1) The swarms you catch in a trap will typically perform better than the ones you knock out of a tree. 2) You’ll lose a portion of the swarms that issue for various reasons like too high in a tree, etc. It’s really nice when that swarm you had to leave in the tree shows up in your trap the next day. 3) Coupled with good swarm management in the hive, and capture of those swarms easy to gather, adding traps is good stewardship. Dr. Lawrence Connor in his book, Increase Essentials, says only 1 in 6 swarms survive their first winter. By capturing them you’re increasing their chances of survival. 4) Swarm captures makes better neighbors. Some neighbors will be as fascinated as you are at the miracle of swarming; others won’t. Capturing your own swarms may prevent you some heartache. This time of year beekeepers perform maintenance and build more toys. 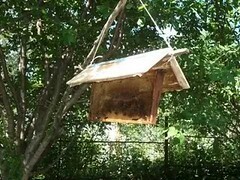 Here’s a link detailing how to build a nice, portable, sturdy hive stand for under ten dollars: Bee Hive Stand for Cheap! Smoke has long been the beekeeper’s secret weapon to avoid getting stung. Ancient Egyptian art dating back over 2,500 years ago depicts beekeepers blowing smoke into hives. But despite the age of this practice and human’s enduring fascination with honey bees, we still haven’t figured out exactly why smoke soothes bees. In research published in August in the Journal of Insect Science, Stephanie Gage, Ph.D., with colleagues at the U.S. Department of Agriculture’s Carl Hayden Bee Research Center and at BetaTec Hop Products, presents a scientific evaluation of smoke on the honey bee’s defensive behavior. The researchers focused on the “sting extension response” and evaluated the effects of two different types of smoke: burlap, which is commonly used by beekeepers, and spent hop pellets—a recycled material made from hop flowers after they have been used to make beer. Because a honey bee (Apis mellifera) hive contains valuable treasure—sweet honey and protein packed larvae—bees must mount a coordinated defense to protect the hive from the many predators that would love to plunder it. A small number of worker bees serve as “guard bees” that patrol the entrance to the hive and watch for intruders. If a threat is detected, the guard will raise her abdomen and extend her stinger into the air. This behavior is called the sting extension response, and it releases an alarm pheromone, or a chemical signal, to the rest of the colony, mobilizing other workers to prepare to attack an intruder. If the intruder provokes the bees further, stinging commences. Upper entrances. Increasing efficiency of nectar delivery to the hive means more honey stored. George Imirie developed a shim to add entrances between boxes. This is an upgraded version and the idea came to me from a friend. An advantage over Imirie’s design is the space between boxes is reduced to 3/8″ thereby reducing burr comb. I modified the measurements and added reducers. 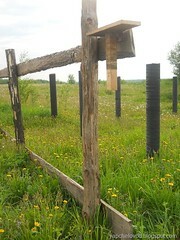 -They allow upper access and reduce travel across the brood nest possibly decreasing brood nest congestion and swarming. -They add ventilation. 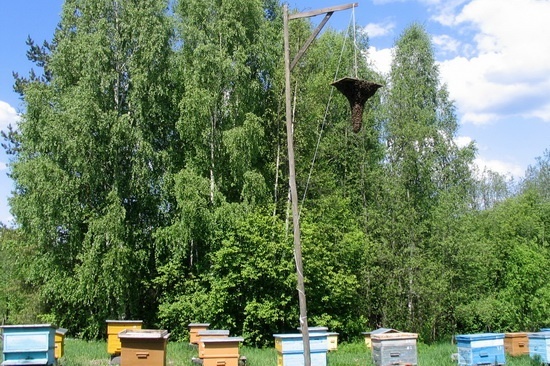 -They cut down traffic across the brood to the honey supers allowing better access thus some think an increase in honey stores. – And if using an excluder it may help encourage storing in the supers. Cost is less than a buck each. Watch “How to Catch and Install a Swarm” and other beekeeping videos on our YouTube Channel! This week reports of swarms have increased indicating that swarm season has started in earnest. The flood of calls has yet to begin but will start soon. This picture, from last year shows a swarm capture utilizing my friend Dave’s combination arborist’s tree tool and a homemade bucket with paint strainer modification. These bees were about 28 feet up. In the US, those interested in catching swarms should visit Bees on the Net which lists beekeepers willing to go out and retrieve swarms in their area. My plan for this coming year is to do some queen rearing. In preparation I will need mating nucs. I pondered using deep 5 frame nucs, which I have a quantity of already, but for various reasons I have decided to use medium height 5 frame nuc boxes. 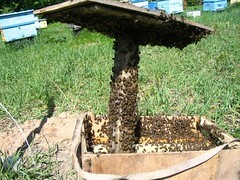 This plan accommodates nuc hive sales as well as queen rearing. Additionally, the medium boxes are significantly cheaper to build as described below. Deep Boxes: 19 7/8″ Length X 9 5/8″ Width X 9 5/8″ Height (Comment: Different bee supply companies makes these different widths. Some as small as 9″ width. Mann Lake makes them a generous 9 5/8″ which I assume is in order to handle their frame feeder. I use this dimension as I have found that whether with or without the frame feeder it avoids crowding of the frames yet doesn’t seem to cause burr comb against the sides. This may not be true if one used frames from a different manufacturer. The above dimensions, both deep and medium, are different than the actual cutting of the box components due to the corner joints. I use a rabbet joint cut 3/8″ deep on the front and back pieces. Because the front and back then contribute to the side length the board on the side is cut 3/4″” smaller than the external 19 7/8″ (side length is cut is 19 1/8″). Making Medium Boxes: My initial estimate is that I can make 11 of these boxes from a single sheet of 23/32″ sheathing plywood. at about $23-$24 per sheet of 23/32″ sheathing that comes to about $2.25 per box. Tops and bottoms will add to this cost. Total waste is approximately 9%. Making Deep Boxes: My estimate is that I can make 6 boxes from a single sheet of 23/32″ sheathing plywood. This results in a price per box of $4. Tops and bottoms will add to this cost. The large reduction in the number of boxes that can be made vs medium boxes is a result of waste which results due to the larger dimensions. Total waste per 4′ x 8′ sheet when deep boxes are constructed from plywood is approximately 28%. Before someone lectures me on use of plywood and it’s longevity, warping, and delamination characteristics please don’t. I have used this particular sheathing and found that with three proper coats of protection it holds up without delamination or warping quite well. Tis the season. My inbox is flush with “amazing” deals. Unfortunately, many of the hard-sell marketers are heading straight for the wallet of the soon-to-be new beekeeper. I’ve watched wannabees, still unable to tell a honey bee from a cockroach, buying specialty hives, extractors, and vaporizers so they will be ready when their bees arrive. The marketers are slick, many offering “free” courses with anywhere from a dozen to 150 lessons to help get you started. Of course, this is nothing new. I first complained about the “lesson plan” back in 2010 when I saw poorly structured tutorials, each designed to sell you one more thing. How much stuff do you really need? Okay, I’m not a minimalist. I find that tinkering with hive design, equipment, gadgets, and technology is enormously fun and educational. On the other hand, you can be a first-rate beekeeper without breaking the bank. No one should be guilted into buying something he can’t afford or doesn’t need. Your need for equipment will evolve as your hobby expands, but purchasing should not be rushed or haphazard. And all those lessons? How discouraging! A hundred lessons on any subject would make me run. Instead, I recommend that beginners read two good books: one that covers basic beekeeping practices and one dedicated to honey bee biology. My recommendation for the basics is either Simple, Smart Beekeeping by Kirsten and Michael Traynor or The Beekeeper’s Handbook by Diana Sammataro and Alphonse Avitabile. If you are a visual learner, the full-color photos in the Traynor book could not be better. For honey bee biology, nothing comes close to Honey-Maker by Rosanna Mattingly. I refer to it constantly. Bee Hive Stand for Cheap! Make this permanent/portable hive stand for cheap or free. 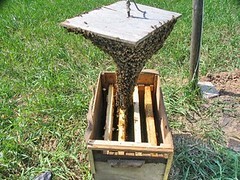 For under ten dollars you can build a sturdy hive stand that can be used in either a permanent or portable situation. Since it uses relatively short pieces of lumber, sometimes you can find scraps and make one free. I have made several of these and use them as portable stands moving them around as I perform hive inspections. Along the way… they sometimes get used in a more permanent way when the unexpected happens and a stand is needed for a captured swarm or an unexpected, but necessary, spring split. You’re going to make several 18″ cuts so if you have a table or radial arm saw set it for 18 inches first. If you don’t have either then that’s okay too – any saw will work. Using the 5/4″ x 6″ lumber cut an additional two 18″ pieces. Reset your saw to 24″ and cut the remaining 5/4″ lumber into 4 pieces. (you will have a short piece remaining). Make another sandwich using the remaining 24″ pieces and 18″ leg pieces. On a flat concrete surface, stand and connect the two sandwiched pieces using the remaining 5/4″ x 6″ x 18″ pieces by nailing them them to the sides joining the sandwiches. Your stand should now be complete and level. 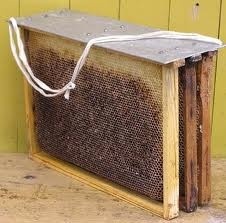 A bee smoker (usually called simply a smoker) is a device used in beekeeping to calm honey bees. It is designed to generate smoke from the smouldering of various fuels, hence the name. 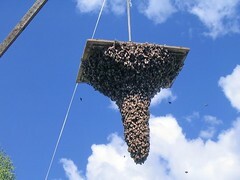 Smoke is of limited use with a swarm, partly because swarms have no honey stores to feed on. It is usually not needed, either, since swarms tend to be less defensive as they have no home to defend, and a fresh swarm will have fed well at the hive it left behind. Blew the thumb out on the glove to the far left. Sad to see this pair of gloves go. But at least I still have the almost new, excellent, serviceable gloves on the right. I’m unashamed of using gloves. I admit to moving too fast at times, going in when I probably shouldn’t, using too much or too little smoke, and otherwise making errors leading to stings. And I admit I don’t care for being stung. Not to mention the black widow spider I find sometimes lurking under a hive stand. Having had great success with recipe Saturdays, I’ve decided to add Vocabulary Sundays. Short and sweet vocabulary building for beekeepers and those interested in learning more before taking the leap. A beekeeper’s jacket is one component of personal protective equipment designed to protect the beekeeper from stings. As the picture above shows, early jackets were most likely of heavy cloth, loosely fitting, with masks made of woven straw. Today’s jackets are still loosely fitting to distance the beekeeper from the stinger but are lightweight with thin mesh veils, zippers, and ventilated cloth. Today’s jackets can be purchased for as little as $10 USD or as much as $150 USD depending on the quality and source. When people start looking for a place to live – a home to own – they generally have a good idea what their needs are. And they know their wants – some special things to make it their dream home. The needs and wants are highly variable, even different in different climates. And frequently the needs of a perfect place to live come before considering the wants. However, many homeowners are enthusiastic do-it-yourselfers. After a few weekends a want leads to a new patio. After that perhaps a garden shed. The DIY projects are endless. Build bookshelves, reconfigure a closet, turn a bedroom into an office and perhaps build a beehive. What do European stock honey bees in search of a home look for? A dry cavity. That is top priority on the need list. (Sometimes it can’t be found.) What about the wants? 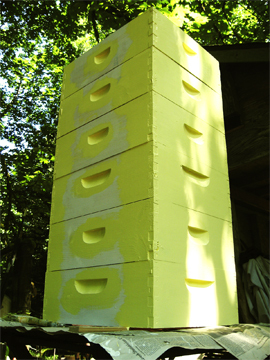 Well, the preferred size is 40 liters, making a deep Langstroth hive body just right. Close to that size is acceptable. Next, a definite need is a small entrance that can be easily defended. The bees would like the cavity placed not too close to the ground. The bees, industrious do-it-yourselfers, will take care of building their own furniture (comb). Last year I made some entrance reducers which I dubbed, “The Gauntlet.” The idea is that it’s easier to defend a long, narrow corridor rather than a shallow doorway. Enter The Gauntlet, an entrance reducer made of 1×2 lumber (dimensionally 3/4″ x 1 1/2″). Using your table saw, cut your entrance to allow no more than 3/8″ entrance height. Width of the entrance is of your choosing but if you need The Gauntlet you probably need a smaller than usual width. Make several, some as small as one bee width. The result is a 3/8″ high, narrow corridor, 1 1/2″ long hallway for any intruders to navigate before they get inside. No need to even pull your old entrance reducer either, just place in front of the old one. Last year a friend and I moved some plastic barrel hives, otherwise known as “cows” into standard Langstroth hives. The cows were impossible to inspect having gone cross-combed almost from the start. Additionally, they could not be assessed for Varroa nor treated. The history was that originally there had been ten but, through attrition, in about a year they were down to two remaining. The move was successful and the colonies flourished through the remainder of the year. How to make a decapping tank. Find storage containers with internal length dimension about 21 inches. (Take a frame with you to purchase). Buy two. Cut about 80% of bottom out of one container. Place metal queen excluder in bottom which will strain the cappings. Measure and make rails such that frames will rest and can’t fall into container. (An empty frame can now double as a decapping rest also.) 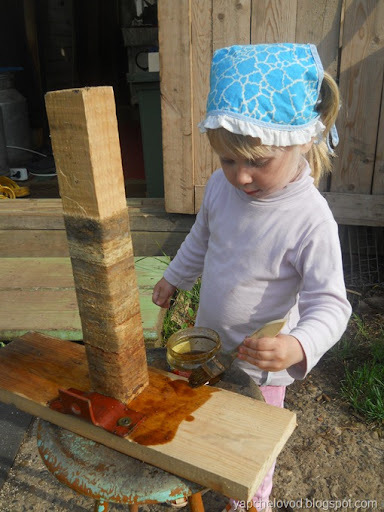 Now slide (nest) this container into the second container which will collect all the dripping honey. Have extra money? 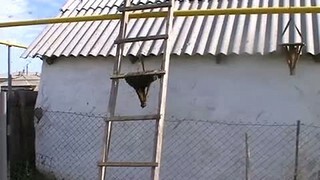 Install a honey gate in the bottom container. The Scottish philosopher wasn’t talking about beekeepers, but he might as well have been. The quotation goes on something like “Without tools he is nothing, with tools he is all”. Which pretty neatly sums up the beekeeper who has lost his hive tool in the long grass. 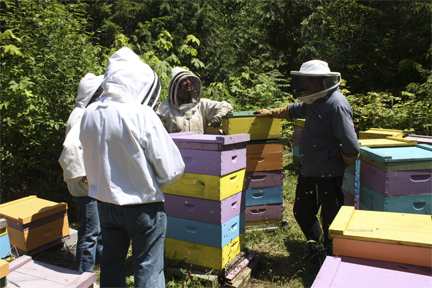 Conducting a full inspection without a hive tool is a a thankless task. You can’t crack the crownboard off (unless it’s a sheet of heavy-duty plastic), propolis acquires the adhesive properties of SuperGlue and your fingers become clumsy, fat, bee-squashing sausages as you try and prise the frames apart. Here are a few more pictures with dimensions for building the upper entrances previously blogged here. 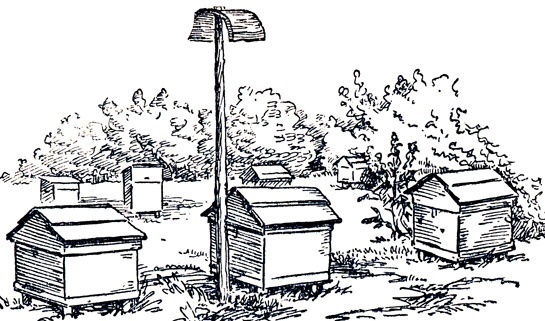 Based on the George Imirie idea that an upper entrance would increase honey production, this is a slight improvement in design with a reduction of spacing between boxes to 3/8″. The bees take to them readily after a short period of discovery. Other benefits may include increased ventilation, less brood box congestion, less travel stain, and increased hive efficiency at removing nectar moisture. Enjoy! I lost my favorite pocket knife, a Buck stainless folder, a few days ago. It’s like losing a friend. Good thing I have old friends like this Buck 110 folder to help me through my grief. Good weather broke out, finally, in July. This is news at Brookfield Farm Bees And Honey here in Maple Falls Washington. The month of June gave us 5 days of sun, 5 days of overcast, and all the rest was rain. So when the sun started shining on July 4 (after 2 inches of rain on July 3) it was actually a cause for celebration – and the sign that I could return to painting bee boxes, tops, and bottom screens. But that’s a bit dull to read about. Some musings, and studies, on what colors bee see would be a bit more interesting. We can never see colors the way bees see them. They can distinguish yellow, orange, blue-green, violet, purple, as combinations of their three primary colors. We can distinguish about 60 other colors as combinations of our three primary colors. Some studies propose that honeybees see orange, yellow, and green as one color (green in that group surprised me). Blue, violet and purple are seen as a second color. Ultraviolet being their third color. It’s not that they don’t get angry (as in “to see red”), but honeybees see the color red as black. Their favorites are said by some to be: purple, then violet, then blue (which all look different to them). I could not find the study that came to this conclusion, but I like it, as my favorite colors are purple, violet, and then blue. Bee’s color sense was partially demonstrated by Karl von Frisch. In 1915, he showed that bees could discern green, yellow, orange, blue, violet, and purple. He did this by using colored cards and bee feed. He imprinted the bees with the idea that feed could be found on a blue card, but not the other colors. When he removed the feed, the bees still went to the blue card. He then tried this with green, yellow, orange, violet, purple and red. The only color it did NOT work with was red. In 1927, Professor A. Kuhn took the study of honeybees’ color sense further. He tested bees using the visible spectrum for humans, but also used longer and shorter wavelengths : the ultraviolet and infrared. The infrared was black to the bees, but ultraviolet was a color. A very nice PowerPoint presentation at this Link from the University of Nebraska, will walk you though an experiment on which colors in our visible spectrum honeybees can see. Sorry, there’s no test for ultraviolet. As you can see over time I have used purple (ok blue to them, but I like purple), yellow, orange, blue and green. It turns out this is helpful to the bees as it distinguishes their hive from the others in the yard. I did it because I thought the bee yards looked prettier with all the colors and red has never been a particular favorite of mine. My most current bee hive top color choices of mariposa lily orange and forest green (the husband says it’s British Racing Green) came from long, diligent thought (kind of). The green was in the hayloft, left over painting trim on my house. The orange was last year’s color, and I had a bit left. That paint ran out before I was done with the tops and the Stockton’s Paints, my favorite paint store is an hours drive away (one way). That’s my one tip on painting: if you are going to take the time to paint your bee gear, use good quality paint. Primer and two coats of color, just like a house. I’ve bee gear that I painted over a decade ago and it is still just fine, even in our 8 month rains. 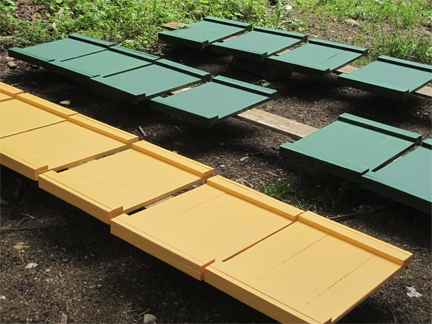 What colors have you chosen for your hives? Why did you make those choices? I think the colors in a bee yard are one of the fun parts of beekeeping. Using waxed nuc boxes this year for swarm traps. Final stages of Scion creation. Another coat of propolis, essential oils, and wax and it’s ready to hang. It is a trap or a shelter to catch the swarm as early as possible without (may be) climbing trees. Can you find it here on the plan? 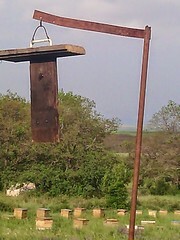 the “scion” is then hanged at around 2 to 2,5 m high. It seems to work !